Bower Fold est une villa de salle de bains de la chambre à coucher 2 du luxe 2, située sur la côte ouest exclusive toujours populaire des Barbade. La villa apprécie un juste renversant de position devant la piscine sur le développement privé de cour de bagagistes, comportant 8 villas traditionnelles de Bajan situe dans les jardins assez tropicaux. La plage magnifique de côte ouest est de seules 3 minutes marchent et les nombreux restaurants, magasins et équipements d'hôtel sont aussi proche. Holetown est la ville principale la plus proche. Bower Fold a été construit à un modèle traditionnel de maison Bajan et a deux grandes chambres, chacune avec la climatisation et salle de bains d'en-suite. La cuisine moderne kitted entièrement dehors avec tous que vous prévoiriez dans une maison familiale confortable. Le salon climatisé et le salle a manger ouverts dehors par l'intermédiaire de deux ensembles de doubles portes au joli terrace avec un BBQ, un table, des chaises et vue piscine. We just spent a relaxing week and loved this villa. Everything about it was perfect. A beautiful pool right outside your front door was perfect for cooling off before breakfast and the quiet veranda was the perfect place for your morning coffee. The beach was a short walk (2 mins ) if you cut through Fairmont resort to go to great beach bar...or a quite 3 min walk down the public footpath. A couple of fantastic restaurants are also in walking distance. We had a lovely dinner at Lonestar overlooking the beach and fantastic Rum Punches at Ju Ju’s Beach Bar. 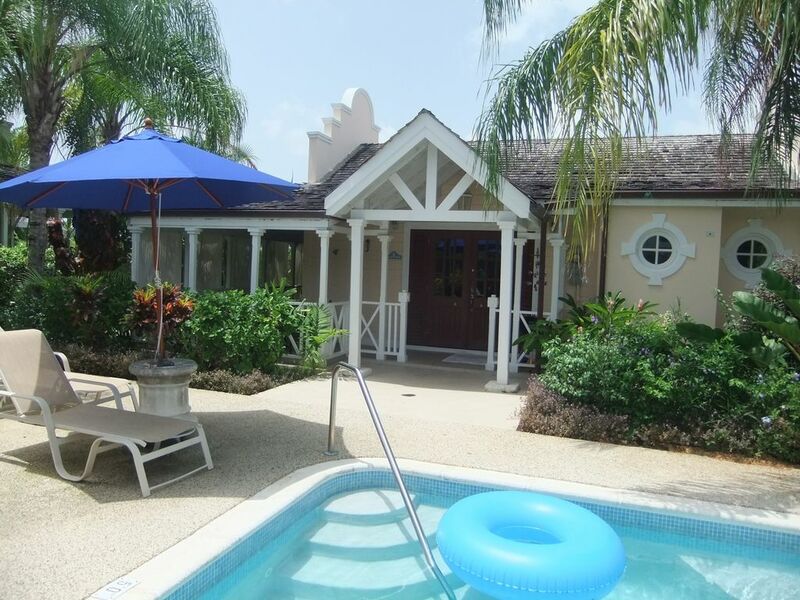 The villa has everything you need, including a get internet TV with every channel and Netflix...lovely air conditioning if needed, however doors and windows all open up for a wonderful, Caribbean breeze to flow through villa. We rented a car and the convenient private parking space was perfect. Thank you to villa owner Debbie for your quick correspondence and for sharing your property...we loved it. Thank you Julie, you were an absolutely lovely guest to host and I am so pleased that you had a great time and loved our "home-from-home" as much as we do. It is true that we are so very convenient for the gorgeous West Coast beach and those great bars and restaurants that you mention, and it is lovely to sit on the shaded terrace and be in front of the pool. Perfect Villa by the Sea !!! The location of the villa was perfect for our family , just across the street from the Fairmont & beautiful beach thru a great private walk. The villa itself was plenty spacious and well equipped for our family of four ( with two children ). The pool outside the villa front doors was an excellent addition & option for those seeking a quiet day away from the sea ( though we spent our whole trip at the beach :)). Debbie was great to deal with & quick to address any needs or concerns !! Thank you. We would highly recommend this villa for a perfect stay by the sea in a charming private setting. Our family really enjoyed it. Thx Debbie for having us. We will be back. I was so happy to have you stay with us! We had lots of fun chats back and forth as we were planning your vacation (did you do your watersports stuff with Tony the Tiger? oh my goodness we love that too!) and I had the real sense once you had arrived that that you loved our villa as much as we and our kids have adored it for the last 19 years. Yes our central West Coast location is fabulous - it is a main reason why people choose us. Perfect top notch location at a reasonable price. Beautiful enclosure with a five minute walk to the beach and lovely shared pool, however the villa could do with 'updating' . Barbados is stunning . Nice stay in beautiful and very clean villa on Barbados, inside of not so rush villas resort. Relative close to the beach in walk distance and with car or bus (3 bus stops) access to city and to the shops. With beautiful pool just in front. Debbie is still on contact with customers and all troubles were solve quickly as possible. We used this villa as part of a group booking for our wedding and our friends thoroughly enjoyed their stay. The villa is spacious, well presented and well equipped. Its location is great and it is close to beaches and in a short driving distance of shops and the supermarket in Holetown. The pool is a good size and there were plenty of sunbeds to accommodate all of our party. Debbie, the owner, was always easy to contact and helpful when answering any queries we had. The only thing that would have made our stay easier is if Porters Court as a whole complex had a website or the villas were linked in some way online to make it easier to book multiple villas. Overall an excellent stay and would highly recommend! We had a fantastic time in Barbados and really felt at home at Bowers Fold. The villa was very comfortable and well situated about 1 mile North of Holetown and with great local beaches, bars and restaurants. Veronica and the maids looked after us well whilst we were there, whilst Sandra was on hand to deal with any queries and sort out a taxi to the airport for our return flight. Dealing with Debbie, the owner was simple and efficient, and she was very helpful in providing lots of information and answers to our queries. The special Low Season deal of £135 is for the use of one bedroom only. The two bedroom rate is £155 per night. A fifth person can be accommodated on a comfortable fold away bed at any time of the year for a price of £20 per night.